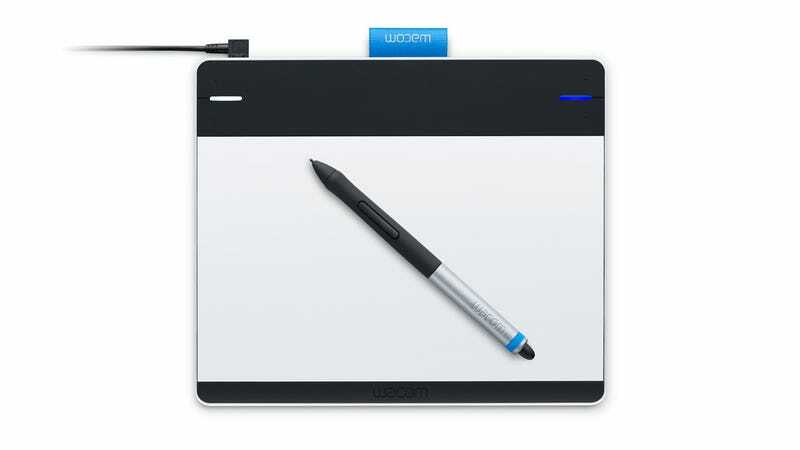 On the heels of its Windows 8 and Android tablets, Wacom just announced a new sleeker and brighter Intuos. The new models are geared less toward professionals, and more toward everyday folk looking to draw and sketch on their computer. The new Intuos comes in 2 sizes—a 6 inch model for $100, and an 8.5 inch model for $200. The size seems to be the only difference between the two. Both feature multitouch and Wacom's signature 1024-level pressure-sensitive stylus controls. The tablets connects to your Mac or PC via USB, but you can buy a separate $40 wireless device to free yourself from the cable. If you are looking for an even cheaper option, you can get an Intuos Pen, which features only stylus control and not multitouch, for $80. These entry level Intuos tablets are replacing the Bamboo labeled products of yore. Also new from Wacom is a re-named Intuos5—it is now Intuos Pro. With the new name comes a couple of minor updates. Wireless control is now included out-of-the-box for three sizes—the 12.6-inch, 15-inch, and 19-inch models, which are $250, $350, and $499 respectively.